Last week thirteen members of the New England Resilience & Transition Network gathered for an Action Planning meeting in Jamaica Plain, Boston. Folks came from Montpelier, Vermont to Portland, Maine to New Haven, Connecticut, and many places in between. It was wonderful to have representation from near and far. 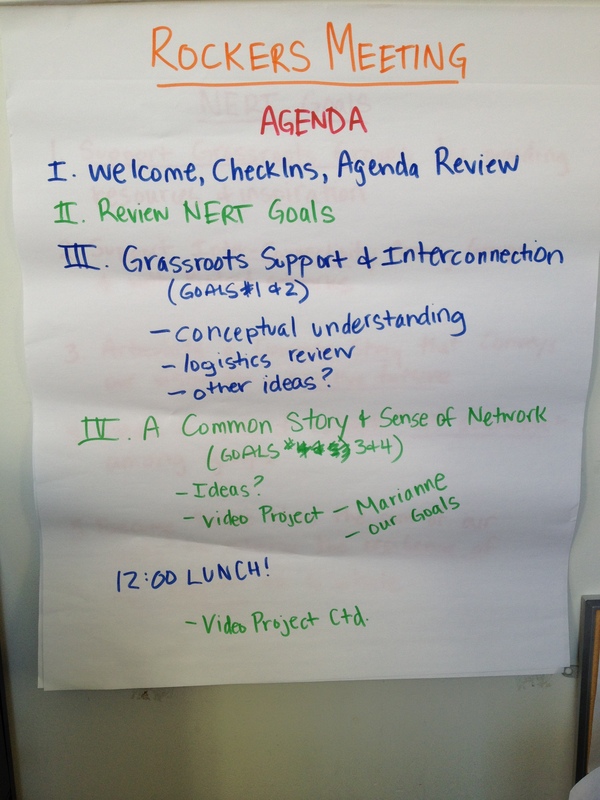 In the morning we focused on the NERT network itself. 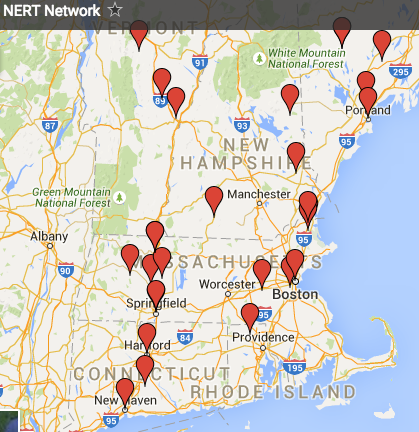 NERT now has 44 members across all six New England states! 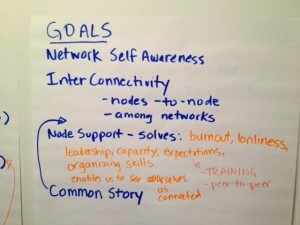 We discussed network engagement, support and inter-connection, in keeping with NERT Goals #1 and #2. We also discussed plans to convene a NERT Advisory Committee to help us stay connected with other networks and glean more information from around the region. 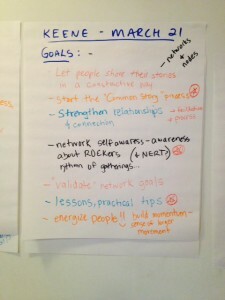 In the afternoon, we focused on NERT Goals #3 and #4: Articulate a Common Story that conveys our vision for a positive future, despite threats of climate change, resource shortages, inequities, and more; and Create a sense of “Network Self-Awareness” among resilience, Transition, and other grassroots groups in New England. As we navigated this conversation, it became clear that more work needs to be done to clarify the NERT vision for the future, as well as our values. We also dug into the idea of producing a 5-minute video for the network to convey the Story of New England and consider what kind of future we want to build together. We agreed that the video should serve as a conversation starter about the future of our common region. We had a rich conversation, asking ourselves: How does New England’s history position us well for a thriving, resilient future? We noted that there are many examples of inter-connection, resilience, and resistance to oppression in the history of the region that can shape our future in a positive way. And we also asked ourselves how our region might heal and atone for the grievous sins of the past, including the genocide of the native inhabitants of this land. We noted that without a process of healing, our future will be shaped by these sins, but this time we will be living in a context of declining economic stability, climate change, and resource depletion. Not a pretty picture. This conversation is far from over; in fact, it’s just beginning. We hope you’ll continue to be involved. To help produce the video, or get more involved with NERT in any way, just email Sarah at sarah@localcircles.org. Click here to see the full notes from the day. 1/20/16 Update: Follow-up conversations have made it clear that the ROCkers are not ready to pursue the video idea, for now. 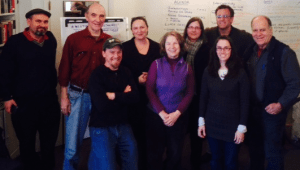 On Saturday November 1, 2014, the ROCkers (Regional Organizing Committee) met for their first in-person gathering to discuss increasing resilience in the New England region. 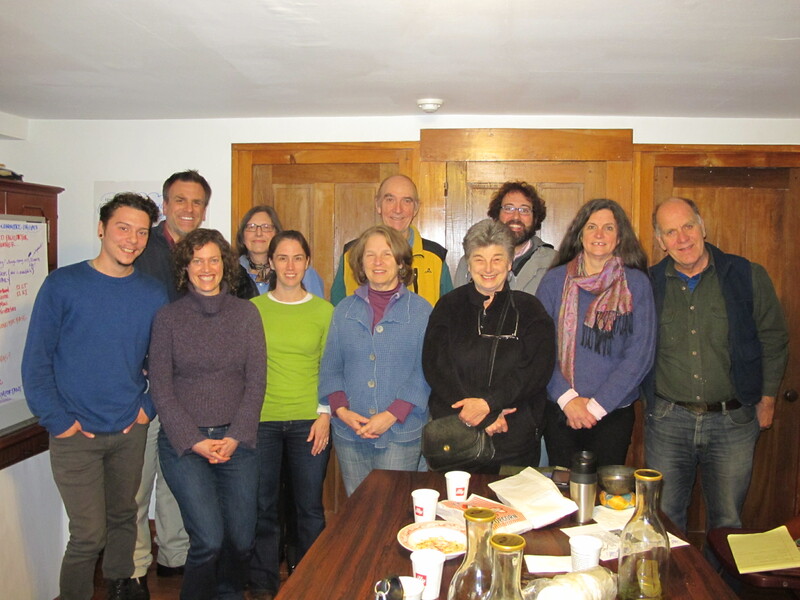 We were hosted by Greg Sankey and others at Revive the Roots, a Transition initiative based at a beautiful farm and common space in Smithfield, RI. The day was divided into three main parts. After introductions, we discussed “Our Story and Our Network.” Secondly, we focused on two key values: Equity and Resilience. After an amazing lunch of soup and eggplant parmesan–made from eggplants grown right there at Revive the Roots–we discussed next steps and hosting a Spring Gathering for the full network. The New England Resilience & Transition network (exact name yet to emerge) has met four times over the past two years. We thought a bit about this history and what led to the formation of the ROCkers. 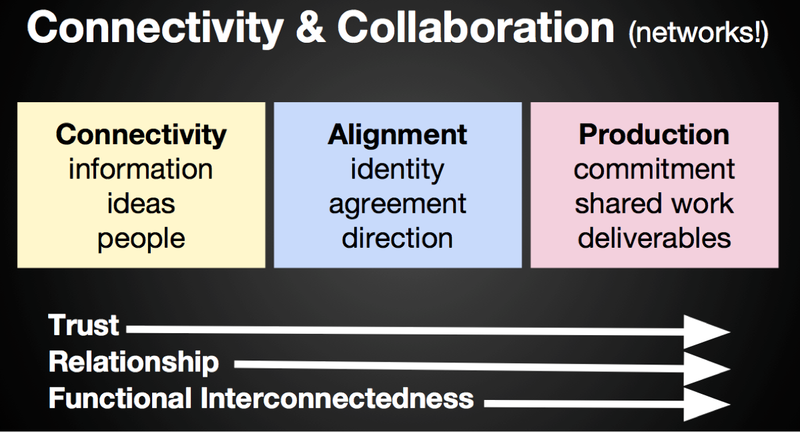 We also delved a bit into “network theory,” noting that networks are based in connections, and can then move into alignment, and finally into action. Trust is the basis of a functioning network, so “whatever else we are doing, we had better also focus on building trusted relationships,” as one ROCker put it. Equity is intrinsic to true resilience. In order to succeed, we need to build a diverse, cross-class movement. We noted that there are challenges to increasing diversity within our local initiatives, and with building alliances with groups doing related work who come from different class and race backgrounds (such as environmental justice groups). We discussed these challenges and also the successes some initiatives are seeing, as well as the importance of forging authentic relationships. 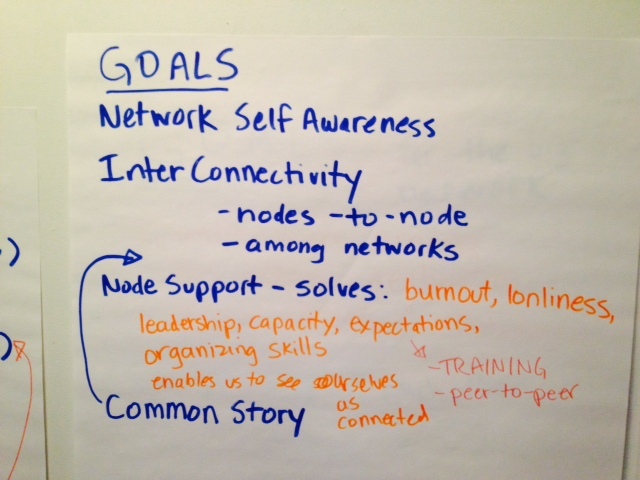 After lunch, we discussed the need to create a “network map” of both the initiatives involved in the bigger network and the greater landscape of activity in the New England region. We also began a conversation about convening the full network of New England grassroots groups for a full Spring Gathering. We considered where and when to hold this gathering. A subcommittee is forming to examine this question further – please email Sarah@localcircles.org to join it. We’d love your input. See the notes from the meeting here. 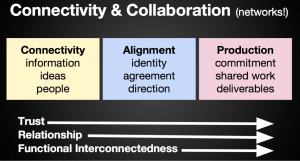 Do you want to ROCK resilience regionally? Join the ROCkers! 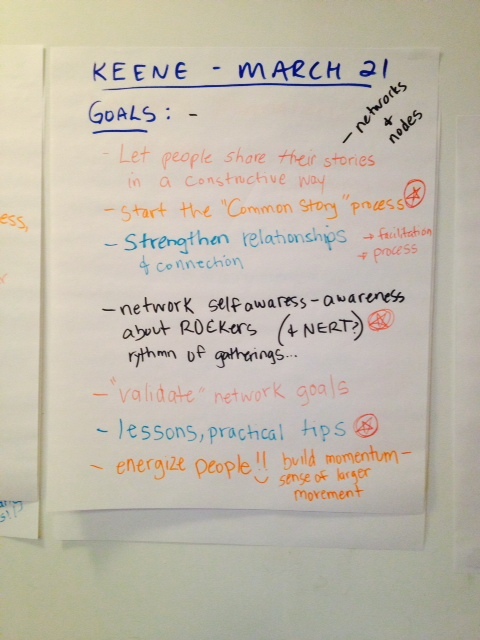 This is a call to action to join the Regional Organizing Committee (aka the ROCkers), a New England network of resilience rockstars. The ROCkers is an open, flexible, and transparent group. The purpose of the Rockers is to enhance local resilience in the New England region. We do that by 1) facilitating horizontal communication among initiatives, both in-person and online, and 2) collaborating on local and regional strategies and actions. 1. You must be active in a local resilience, permaculture, green, energy, food, sustainability, environmental justice, new economy, time banking, Transition, or other group. 2. You support the purpose of the ROCkers (above). 3. You commit to supporting and attending one in-person gathering per year, which will vary in location from year to year per the group’s decision. You also commit to attending three remote meetings per year, via conference call or online platform. The structure and function of the ROCkers will be determined by its members at an in-person gathering we will co-create in the fall. Please come with your ideas, your wit, and your willingness to act! To join the ROCkers, simply reply to Sarah Byrnes (sarah@localcircles.org) by Tuesday, July 15. We’ll then immediately start planning for our in-person fall gathering. We are inspired by Rob Hopkins’ observation that local Transition initiatives often experience a “donut effect,” where a group’s energy drifts into projects and a gap develops at the center. It is exciting that projects to support regional resilience are happening in New England: a regional network of academics is forming, there is a regional Photo Slam, and folks are talking about a “Whole New England Catalog.” The Rockers will be designed to “hold the center” of this regional work and ensure that core region-wide communications carry on. Members commit to one in-person and three remote meetings per year, and have the technological capacity to meet over the phone and/or online. This proposal is up for discussion and reaction. Please join a phone call about the Rockers on June 26 at 7pm. To attend, RSVP to Sarah Byrnes, sarah@localcircles.org, and we will send you the login details. We are eager for your thoughts and need your involvement to make this happen! Please join us on June 26! * Of course, we don’t expect the Rockers to shoulder all the detailed work. 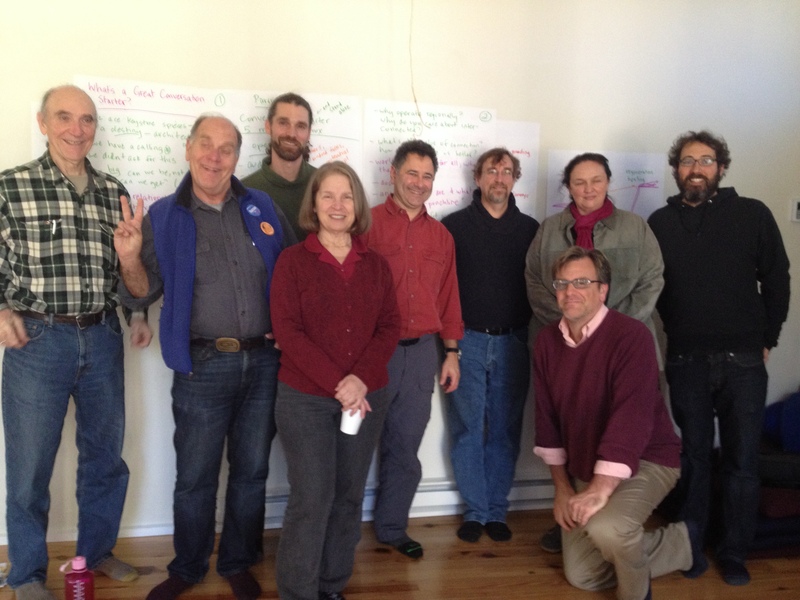 As has happened in the past, a group of folks will need to commit to various organizing tasks. For example, leading up to the events in Boston, Brattleboro, Portland, and Keene, a region-wide team of 6 or 7 folks worked with a local team to organize each event.